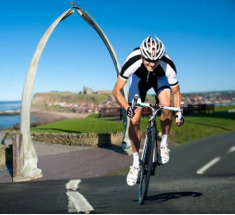 This Sportive is part of the World famous Whitby Regatta. A rare blend of coastal and moorland roads, all of which are spectacular! A great event for riders outside of the area wanting to enjoy a wide variety of this great area or for locals to discover some fine new roads. The return to the Cliff Top to an excited crowd of literally 1,000's is an wonderful occasion, you could be a TDF Star! A great event to bring the family to and leave them to enjoy the Regatta whilst you enjoy the ride!